Choosing the right ESP for you and your business can feel like it fits into life’s major stressors: divorce, death, moving… Okay, Okay, that may be a tad bit extreme. However, it can be quite the daunting task and one critical element is often overlooked. Insights needs to be at your fingertips: Fast and available statistics and reports. So which email marketing analystics should we be looking at? When selecting an ESP, there are so many elements to consider like cost per month, sending limit, having an audience cap, etc. These are but one not so obvious feature you should examine when picking an ESP: what advanced email and reporting analytics it offers. No, I’m not asking if they track opens, unsubscribes and CTR’s. Don’t get me wrong, measuring your opens and CTR is a must and the foundation of measuring basic email success. However, if you are only tracking these metrics, you are simply skimming the surface when it comes to uncovering the motivation and needs of your audience. Everyone’s needs are different, but if you do the research to ensure the ESP you picked has the advanced reporting tools required to execute killer marketing strategies, it could make all the difference to your success. Without further ado, let’s check out some awesome analytic and reporting tools that will take your email game to the next level. When you are crafting your email copy, it’s essential to know who AND where your audience is, so you can speak directly to your readers. With heat mapping, you can pinpoint the best areas for geographical targeting. 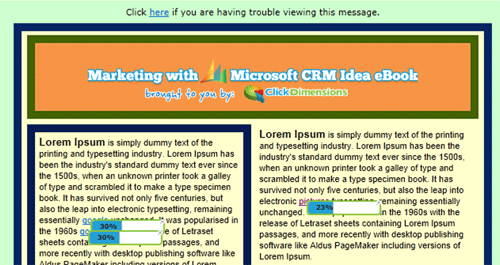 An example of heatmap from dotmailer’s analytics. Tracking opens by geographic location can go hand in hand with heat mapping. You can leverage the information you gather by heat mapping and tracking geographic location through implementing localization in subject lines. That way you can target an email send by location. 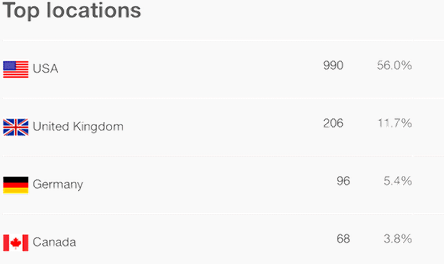 This is a screen capture of geographic targeting from MailChimp’s analytics. The mega retail store, Target, tested localization in promotional emails by identifying which Target stores were close to their recipients’ listed address. The email sent to their audience featured the name of the subscriber’s local store in the subject line, as well as that store’s telephone number and store-specific links. Using this tactic can increase the likelihood of a purchase by 50%! Not too shabby, huh? In a study by Mailchimp this notion was supported as well, localizations (such as including a city name) improves open rates big time. Adding the small detail of localization will make recipients feel like the email is that much more relevant to them and in turn, increase email metrics. Engagement reporting is software that can track how long a subscriber has an email open, essentially measuring what happens between an open and a click. This offers a lot of context to open rates, because sometimes recipients only open an email just to hit the delete key immediately. With these metrics you can identify if it was an open where your message got across to the reader, or an open where the subscriber was trigger happy to trash your email. This is a screen capture from Email on Acid’s analytics tool. Easily identify the campaigns that engage your customers for the longest period of time and then pull out the marketing elements that set that campaign apart with these metrics. From there you can implement those tactics for future email to create more engaging email campaigns. There are thousands of client quirks out there ready to make your email look crappy. That’s why you want to focus your energy on coding your templates for clients that your subscribers are actually using. That’s where email client reporting comes in! Many ESPs track what devices and clients your emails are being read on. For example, the #1 mobile device for your audience could be the iPhone 6 and the most popular email client may be Outlook. This data is essential when it comes to optimizing the design and content of your emails so you can ensure pixel perfection on the device and client the majority of your audience is reading on. This is a screen capture from Emma’s client reporting. Interactive graphs allow you to take different views on your reports. For example how many emails were delivered, how many people opened your email, what percentage clicked, and more. These graphs are also great for looking at a macro view of your email marketing efforts. The example below tracks list growth, month by month, so you can see if you are improving or where you need to ramp up your efforts. 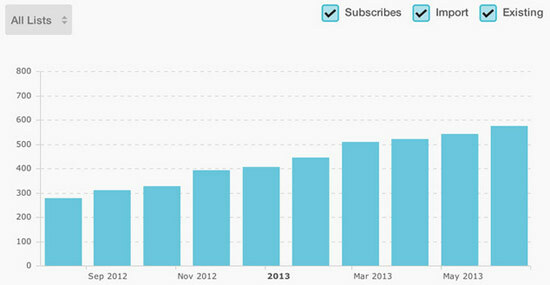 This is a screen capture from MailChimp’s analytics. A number of ESPs can offer more granular reporting with subscriber activity reports. It’s a snap shot of each subscriber’s interaction with your email campaigns. 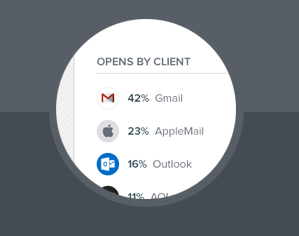 For example, you can dig even deeper with these reports to track an individual’s email activities like when they opened, what they clicked, and where the email was read. Above is an example of a subscriber level report from Campaign Monitor. One way you can utilize these reports into your email efforts is resending to all the subscribers that didn’t open, but I advise you use a different subject line the second time around! 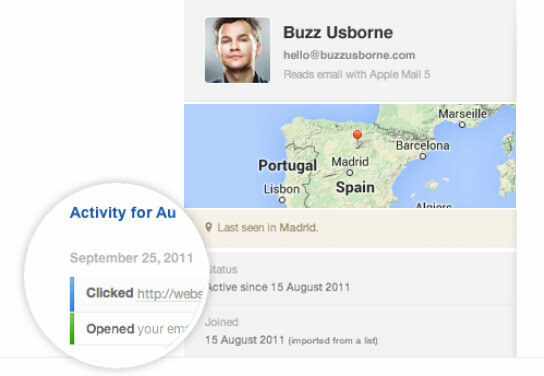 There is another nifty feature tons of ESPs have called email click map overlay. This lets you gauge what interests your audience the most within your email. Forget only tracking CTR, with the click map overlay you can see if your audience prefers pictures to text, where in the email most of the clicks happen, etc. For example, if you saw that most clicks happened at the top of your email, you would make sure your CTA was above the fold. This information allows you to learn the habits of your audience and in turn, create more enticing mailings for them. This is a screen capture from ClickDimensions. Email and social media can work together in unison to help push toward your marketing objective. That is why it is critical to integrate your social pages into your email campaigns. With the proper social tracking in place, an ESP can allow you and your audience to share your campaigns on Twitter and Facebook by embedding a “Like” or “Tweet” button in your emails. You can see you how many people shared your email, who shared it, and even what they said about it to their friends and followers. Are you wondering how last year’s Christmas campaign compares to this year’s? How last month’s newsletter compares to this month’s? No problem! 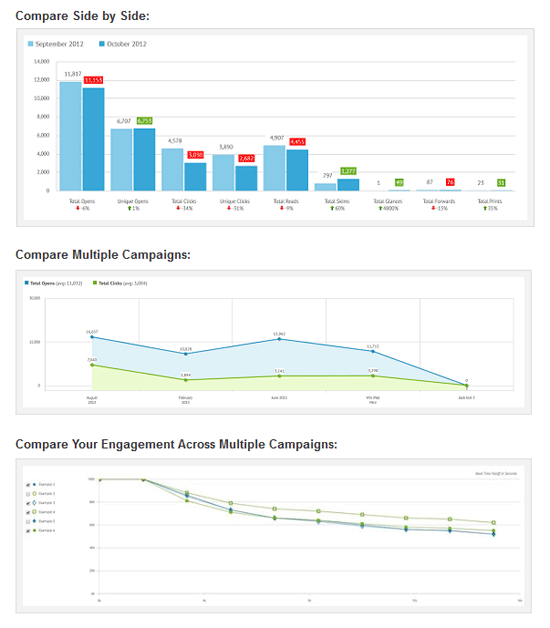 ESPs can compare engagement across multiple campaigns or even view two campaigns side-by-side in a flash. That way you can easily identify which emails are speaking to your audience and which are, well, missing the mark a little. This is a screen capture from Email on Acid’s analytics. What you don’t know can hurt you, and that’s why you need find an ESP that will go beyond just tracking opens and clicks. To create a killer campaign that spurs your audience into action, you must “know your audience”. Knowing your audience as a marketer boils down to leveraging the right advanced email analytics and reporting tools to uncover the audiences’ interests, and pain points. So, be diligent as you look through your next potential ESPs repertoire of tracking tools so you know you are getting the most bang for your buck! See any tracking tools you like listed above? Give ‘em a ring and see how they can help test and track your way to more successful campaigns.